I’d been hearing the distinctive “gobble, gobble” sound for a few days, but hadn’t seen the authors. Then the dog started barking like crazy and I thought he’d seen some deer. 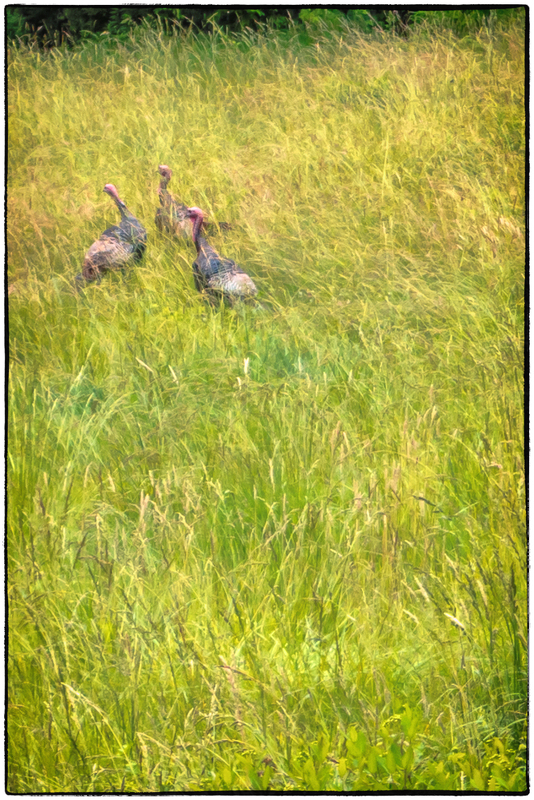 When I took a look I didn’t see any deer, but I did see this trio of wild turkeys in the meadow adjoining our property. I was a very long way away and the turkeys were barely visible on the LCD screen of my Sony RX100 so I just pointed the camera in the general direction and hoped. This is a very extreme crop and so the sharpness and detail leave a lot to be desired. I does have a sort of “painterly” almost impressionistic look to it that I rather like.